There was no visiting speaker but in the second half of the meeting Interest Group Leaders showcased their groups by talking about what they do, highlighting near-future activities. 1. Welcome. Gret Woodason (Chairman) welcomed all members, including a special welcome to the new members. She began the meeting by announcing the recent death of Betty Tobin, who was an active member of the Scrabble and Food with Friends groups, and also announced the death of Bill Plant, the husband of our member, Hazel Plant. Gret asked for a few moments of silence while we remembered them. 2. Apologies for Absence were from Shirley Scammell (Membership Secretary), Dave Morey (Treasurer) and Lynn Cronin. 3. Minutes of Previous Meeting held on 10th July 2018 were signed off and available on the notice board. 4. Matters Arising – There were none. 5. Chairman’s Report Gret announced she had booked the Post Christmas Lunch to be held at Sandy Lodge on Friday 4th January at 12 noon for 1:00pm lunch. The cost will be £14.50 for a three course lunch, plus tea and mince pies at 3pm. Tip not included. We will be asking members to sign up for it next month. 6. Website Coordinator’s Report – John Woodason (Secretary) announced we have a new website using a generic website model created by the National U3A Organisation and showed us a few of the screens: https://u3asites.org.uk/newquay It was also pointed out that we need photos of recent group events to be sent for inclusion on the website and our Facebook page. 7. Vice-Chairman’s Report – we do not have a Vice-Chairman yet. We need a volunteer. 8. Secretary’s Report – Nothing to report. 10. Groups Coordinator’s Report – Margaret Harris announced that Mavis, the leader of the Social Group, was standing down. She will only be organising the next two meetings. We therefore need a new leader for this group. 11. Membership Secretary’s Report – There were 70 members at the meeting and 4 visitors. 12. Publicity Coordinator’s Report – Gret announced that the September Newsletter and 3-Fold were available at General Meetings and had also been sent out by email. 13. Programme Secretary’s Report – There is no change to the speakers we have already booked until November 2019. 15. Other Miscellaneous Social Activities – Gret announced that the Lane Theatre have two new plays on. Details available in the Foyer. Chris Squib needs someone to give a talk about Corn Dollies. Veronica Wood has found a female cat, about 4-5 years old, tabby with white nose & white paws. If anyone knows anyone who has lost their cat of this description they should contact her. Peter told us how 11 years ago, when Newquay U3A was established, he was a keen gardener and was asked to lead a Garden Appreciation Group. He explained that the few original members were all eager to volunteer as Group Leaders and other roles. Today he was appealing for more volunteers to come forward to possibly lead a group and importantly to volunteer to become a Committee Member, which is needed to keep Newquay U3A running. Margaret explained that although the mini-bus for 25th September visit to Glendurgan is full, there would possibly be some spaces in cars that would be going. The date for the Garden Appreciation Christmas lunch is Tuesday December 11th. Sue, a member of this group, told us that the Music Appreciation Group has been going for 7 years and is held on the 1st Tuesday of the month usually at a member’s house, with refreshments provided. Their interest covers all genres of music, but mainly classical. At their meetings they listen to pieces of music and learn about composers’ lives. They also attend concerts and watch ballets at the cinema. Maureen told us the Readers Group meets at the library on the last Friday of the month, where the Library provide each of the group with copies of new books they have in, so you might get to read books that you perhaps would not normally read. At the meetings there is lively discussion about the books they have read. The group also swap books with each other. Maureen told us that Rummikub is like Rummy but using tiles instead of cards. They meet at the Lanherne every Thursday afternoon. There is no charge, except that they buy tea, coffee or a soft drink, to support the Lanherne. This is held on the last Friday afternoon of the month at the Lanherne. They usually get between 5 and 8 people attending, but more members are welcome to come by prior arrangement, as there would not be enough parts for too many people. Plays can be drama, comedy or even murder mystery. Marion, a member of this group, informed us they meet on the first Thursday of the month at various different venues all around Cornwall. Anyone can join the group using any kind of camera, even a smart-phone. Each month there is a different theme for the subject matter. A competition is held six times a year for the best photos. The next meeting will be at St Ives on 4th October and the meeting in November will be held in Crantock Hall to discuss venues for the coming year. Chris told us this group has been running for 8 years. It is a very light-hearted and fun group which meets usually in the Quintrell Inn on the last Monday of the month (except August). Each session is themed with a specific topic or activity. The current topic is “What’s it made of?” Visits are also arranged to National Trust Properties, Antique & Vintage Clothing Shops, Collectors’ Fairs and Auctions. Alison talked about her small, friendly group who meet at her house on the 2nd and 4th Thursday evenings of the month over tea, coffee and cake or biscuits. They look at different poetry styles and techniques, poems that members know and like, and some that may be unfamiliar. Some poems are short, some are long, like “The Ancient Mariner”. They have recently looked at poems by Cornish poets, and well known poets such as Robert Burns, John Betjeman and Keats. They have even looked at the poetry in song lyrics. They are currently looking at American poetry and female poets. Gret said this is a fun group that meets currently at her house on the 2nd Friday afternoon of the month, where they have a laugh singing songs of all genres. So if you enjoy singing in the bath or shower you will like singing along with this group. Gret has recently joined this new group, currently meeting on the 2nd Monday afternoon of the month at her house. During a visual presentation on the screen of the group’s current agenda and future aspirations, Gret told us how much she was enjoying her new writing experience, and read us her first piece of writing from a first line prompt she actually chose herself, from a book of 1001 story starters. Shirley confessed that the Beginners’ Bridge Group started 5 years ago and the group members still say they are beginners! There are between 12 and 25 people who meet every Wednesday afternoon at the Lanherne. Real beginners and new members of the group need to come a little after the starting time, as it can get a bit chaotic! The smaller, more experienced Bridge Group meet every Friday evening at Sainsbury’s cafe. The group members each pay £1 per week into the kitty, and once or twice a year make a donation to Sainsbury's chosen charity of the year. They recently gave £200 to the Air Ambulance, and since the start of the group have probably donated around £500 to various charities. Chris said that the Scrabble Group has been running almost from the start of Newquay U3A and meet at the Lanherne on the first and third Monday afternoons each month, where all you need to do is buy a tea or coffee for £1. All abilities are catered for and there is a larger print Scrabble board for those with visual difficulties. New members to the group are always made welcome. John said that he was told that the Whist group was started to enable members to move on to Bridge. The Whist Group is a small group, currently of about 9 people who meet on the second and fourth Monday afternoons of the month at the Lanherne. Different variations of the game are played. A few members of the Whist Group expressed a wish to learn Euchre, which is an entirely separate game to whist, but it was less popular than whist, so it was dropped. Beginners and improvers are welcome to join the group. The only charge is for tea or coffee. Jan told us that they play Table Tennis on Monday, Wednesday and Friday mornings at Crantock Village Hall, where they get 15 to 25 people aged between late 50’s and mid 80’s. There are four tables available between 9am and noon, so you can come along just for an hour or so or stay all morning. The standard is very varied: some are exceptional players, some not so good. Beginners can come to the Wednesday session where someone will always help those who lack skill and confidence. The charge per session is £1 - £2, depending on the numbers. In Janet’s absence John, who is a member of the group, talked about the group, whilst operating a slideshow of photos of the group on various walks. He told us that the group has been going for a year. In that time they have had fourteen walks in various locations in Cornwall. John said how good it is to do these walks and discover new places. They travel by car, starting the walk from a car park and usually do a circular walk to end back at the car park. Janet is a very good walk leader and always checks out the walk first. Planned walks sometimes have to be cancelled due to bad weather, but Janet will then organise the walk at a later date. Sensible shoes or boots are a must on these walks. Our Sheila stood up with her scribbled notes to tell us about her walks. This is a very friendly group. There are between 10 and 22 members on the walks which either start in Newquay or from somewhere on a bus route, so there is no need to use cars to get there and back. The walks can be between 3 and 5 miles and always end at a cafe or pub. Sheila loves to help people learn about their family history. On a one-to-one basis she will meet anyone wanting to find out all about their family history at the library. All you need is your grandparents’ names and dates of birth and you will be surprised how much you will find out about your family tree. Sheila explained that the Cornish Dancing Group was full, and as they were all getting better at it, it would be difficult for anyone new to join the group, although if there was the demand she might start another group. She told us they would be dancing at the Lowender Peran Music and Dance Festival at the Hotel Bristol on Sunday 4th November. Sheila said this group will be knitting poppies for the library on Thursday 20th September at the Lanherne. Bring size 9 needles and red wool. 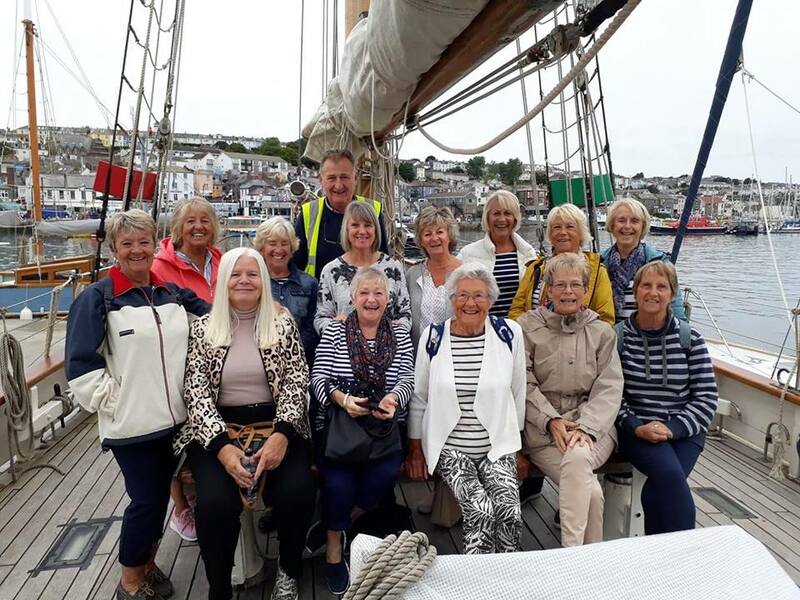 Sheila told us about the trip to Falmouth she had organised for her Dancing Group, for a trip on the “Spirit of Falmouth” tall ship. They thought all they would get was a trip around the bay and a tour of the boat, but when they boarded the ship they were told to put on life jackets, although the sea was very calm. Their trip started at 11am and they arrived back at 4:30pm. During that time, as well as a trip out to sea, they had a tour of the ship, some climbed the rigging up to the crow’s nest and some even steered the ship. Some went out on a motorised RIB (rigid inflatable boat). They were also provided with lunch. All that for just £10. Sheila informed us that the Flying Scotsman will be running to Penzance on 4th, 6th and 8th October and that she intends to go to Penzance to see it. Trips on it are very expensive. We have 2 sets of boules. All we need is a venue where we can play, so offers of a garden big enough in which to play boules or petanque would be appreciated. Rachel and Val took over leading this group in July. They book tables for U3A members at various venues, and at various times. They say the problem is that they have to sample meals at the venues first, so will end up being larger than they were when they started organising the meals! They would welcome suggestions from members who can recommend venues. Christmas lunch will be at the Carlyon Bay Hotel on Saturday 15th December at 1pm. Deposits were needed at the 11th September meeting. These are held at the Fort Inn every other week starting on Sunday 23rd September at 12.30am. A table for 14 has been reserved for our U3A group, but if more people turn up the Fort Inn staff will increase the area we occupy. There is no need to book, just turn up. The carvery lunch is £8.95 for the small plate (2 slices of meat instead of 3, but still as much veg as you can fit on the plate). For garden enthusiasts, Sheila has a garden full of Echiums she will deliver to anyone who wants them.